Tuesday November 14th 1899 I tried to sew some in the forenoon besides getting the dinner. Will went to Hill Siding in the afternoon he took me up to Gregorys and then come after me. Did the evening work and went to bed early. Wednesday November 15th 1899 The boys busy husking. I had early dinner and Will went to town in the afternoon. I sewed in the afternoon and evening. Weather pleasant again. Thursday November 16th 1899 The boys finished today all but some shock corn. In the afternoon Will and Leonard moved the refrigerator into the milk house. Will helped me wash in the forenoon. It was a fine day. I did a little more papering in the pantry and after supper the boys put the cup-board in there from the dining room. 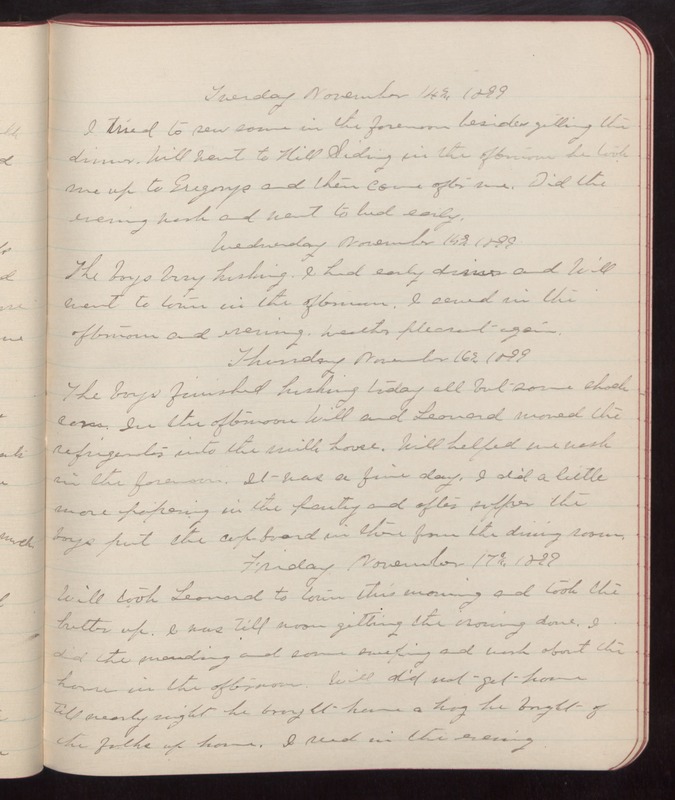 Friday November 17th 1899 Will took Leonard to town this morning and took the butter up. I was till noon getting the ironing done. I did the mending and some sweeping and work about the house in the afternoon. Will did not get home till nearly night he brought home a hog he bought of the folks up home. I read in the evening.